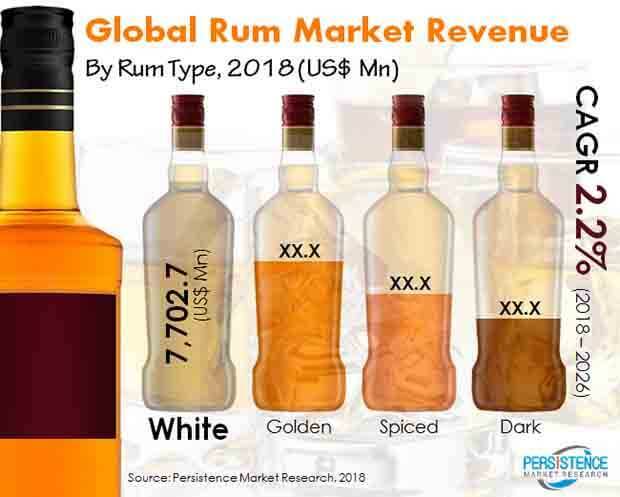 The Persistence Market Research report on global rum market analyzes opportunities in the market and presents updates and insights pertaining to various segments of the global rum market over the forecast period, 2018–2026. This report covers trends driving each segment and offers analysis and insights into the potential of the rum market in specific regions. Detailed profiles of the providers are also included in the scope of the report to evaluate their long-term and short-term strategies, key offerings and recent developments in the rum space. Rum market participants include, Bacardi Limited, Diageo PLC, Pernod Ricard SA, Admiral Nelson’s Rum, Ltd, William Grant & Sons Ltd., Remy Cointreau USA, Inc, Maine Craft Distilling, LLC, Lyon Distilling Co, Westerhall Rums, Cayman Spirits Co, Hampden Estate Rum Tours, Halewood International Holdings PLC, Mount Gay Distilleries Ltd, Suntory Holdings Limited, and The Westbourne Drinks Co.
Persistence Market Research offers an eight-year forecast for the global rum market between 2018 and 2026. In a recently released report by the company, the global rum market is expected to register a CAGR of 2.2% during the forecast period. The primary objective of the report is to offer insights on the advancements and opportunity in the rum market. The study demonstrates market dynamics that are expected to influence the current challenges and future status of the global rum market over the forecast period. This report also offers updates on trends, drivers, restraints, value forecasts, and opportunities for manufacturers operating in the global and regional rum markets. The scope of our study for rum includes commercially important rum available in the market. The global rum market has witnessed impressive growth over the last couple of years driven by a number of favorable factors. Growing urban population coupled with rising disposable incomes in emerging economies is leading individuals to explore new forms of entertainment such as night parties and spending time at bars, pubs, and lounges. Further, young adults with spending power, social media influence, and easy access to alcoholic drinks are other prominent factors driving sales of alcoholic beverages. In urban areas, high pressure jobs and the perception that consumption of alcohol is relaxing to the mind is leading to the increased consumption of rum. Manufacturers of rum that are continuously launching new products with unique flavors. Curiosity among consumers especially among millennials is attracting them to try these products, which is having a positive bearing on the rum market. The global rum market by rum type is segmented into white, golden, dark, and spiced. The white rum segment is anticipated to grow at a robust CAGR in the global rum market over the forecast period owing to rising demand for alcohol beverages among continuous launches of flavored alcoholic drinks. Consumers across the globe are demanding for alcoholic beverages which is pushing the revenue generation of the white rum segment, hence the global rum market in the near future. Furthermore, demand for super and ultra-premium rum has created tremendous opportunities in the global rum market. By distribution channel, the global rum market is segmented into hypermarket/supermarkets and liquor shops. The liquor shops segment followed by hypermarket/supermarket segment is expected to account for significant market share in the global rum market in the near future. The global rum report includes market share of each segment according to the region with analysis towards market trends respectively. By region the global rum market is segmented into North America, Latin America, Europe, Asia Pacific, and the Middle East & Africa. Popularity of rum among young consumers has been a prime factor contributing towards the market revenue generation in the rum category in respective countries. A section of the report highlights the global demand for rum, including per capita consumption patterns. It also provides a market outlook for 2018–2026 and sets the forecast within the context of the rum ecosystem, including the new product developments as well as product offerings in the global rum market. This study discusses key trends contributing to the growth of the global rum market, as well as analyses the degree to which drivers are influencing the global market. In the final section of the global rum report, a competitive landscape has been included to provide report audiences with a dashboard view, as well as the sales in terms of number of cases of key manufacturers. Detailed profiles of the providers are also included in the scope of the report to evaluate their long-term and short-term strategies, key offerings and recent developments in the global rum market space.